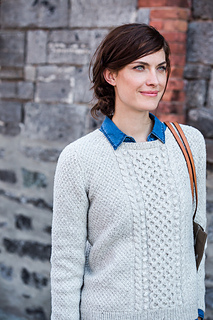 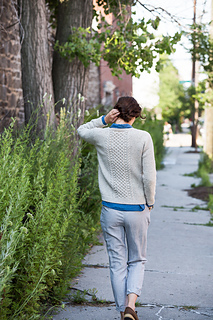 Classic Aran style goes minimalist in a pretty pullover with just enough details. 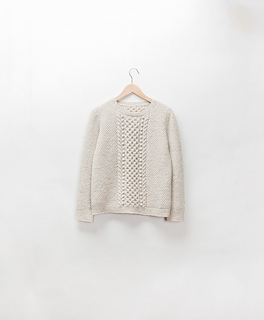 Honeycomb panels flanked by crocheted bobbles and mirrored cables adorn the front and back on a plush bed of gently textured moss stitch. 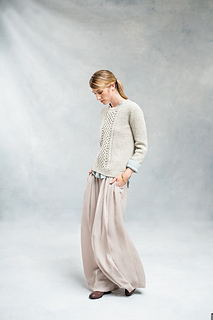 Several inches of positive ease keep the fit relaxed enough for weekend wear, but professional good looks make Backbay fetching with a wool skirt and tights or a smart pair of trousers, too. 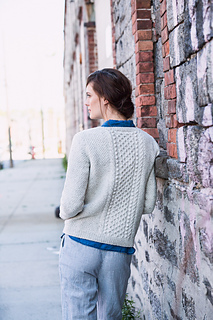 Backbay is knit with Shelter in the round to the armholes; the front, back, and set-in sleeves are then worked flat and seamed together. 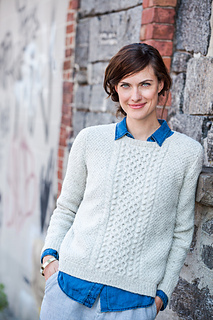 The pattern includes directions for thoughtful details like garter stitch selvedges; tubular hem, cuff, and neckband ribbings; and a special bind-off over the cabled portion of the fabric for a neat and elastic finish. 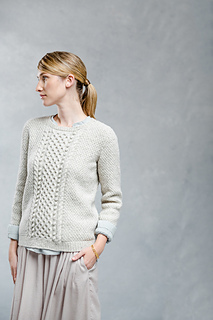 Please note: the cable stitch patterns in this garment are charted only.